New Delhi: At present, there are 41 Central Universities (CUs) under the purview of this Ministry.n The details of sanctioned, existing and vacant posts of teaching and non-teaching staff in 40 Central Universities under the purview of this Ministry as on 01.04.2017 are enclosed at Annexure-I & II respectively. The similar details in respect of Indira Gandhi National Open University (IGNOU) are at Annexure-III and Annexure-IV respectively. The sanctioned strength of teaching posts keeps on increasing due to opening of new Departments/courses in CUs. Vacancies at various levels are also caused by dynamic processes attributed, inter-alia, to retirements, resignations, deaths, deputations, expansion and opening of new institutions. Filling up of new sanctioned posts and vacancies in them is an ongoing and continuous process. (i) There is no ban on filling up of teaching posts. UGC Regulations on Minimum Qualifications for Appointment of Teachers and Other Academic Staff in Universities and Colleges and Measures for the maintenance of standards in Higher Education 2010 envisages that all the sanctioned / approved posts in the university system shall be filled up on an urgent basis. (ii) 5 Visitor’s nominees have been provided to all CUs for Selection Committees of teachers in order to expedite the recruitment process. (iii) In order to meet the situation arising out of shortage of teachers in universities and the consequent vacant positions, the age of superannuation for teachers in Central Educational Institutions has already been enhanced to sixty five years. (iv) Teachers can also be re-employed on contract appointment beyond the age of sixty five years upto the age of seventy years, subject to availability of vacant positions and fitness. (v) UGC initiated a scheme called Operation Faculty Recharge for augmenting the research and teaching resources of universities to tackle the shortage of faculty in university system. (vi) UGC also framed the guidelines for empanelment of Adjunct Faculty in Universities and Colleges. 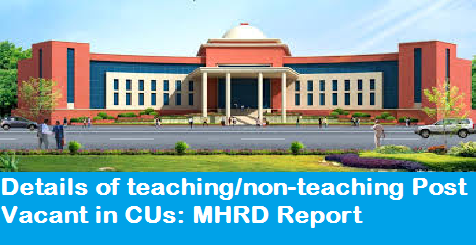 These guidelines enable higher educational institutions to access the eminent teachers and researchers who have completed their formal association with the University/College, to participate in teaching, to collaborate and to stimulate research activities for quality research at M. Phil and Ph.D. levels; and to play mentoring and inspirational role. In order to ensure that studies of students are not affected due to shortage of teachers, CUs are adopting different methods/processes to address faculty shortages which include hiring ad-hoc faculty, temporary faculty, engaging services of retired teachers and visiting faculty etc. This information was given by the MINISTER OF HUMAN RESOURCE DEVELOPMENT SHRI PRAKASH JAVADEKAR in a written reply to a question in Lok Sabha on 24th, July 2017.